Approximate Dimensions (in inches): 2.75 H X 16.25 W X 11.0 D. Serve, dine and decorate with this versatile wood and rattan tray. Serve your guests drinks, appetizers or desserts with its easy to transport cutout handles. Dine in bed with your loved one when you have this elegant platter. Decorate your ottoman or coffee table while adding extra storage for magazines or media remotes. 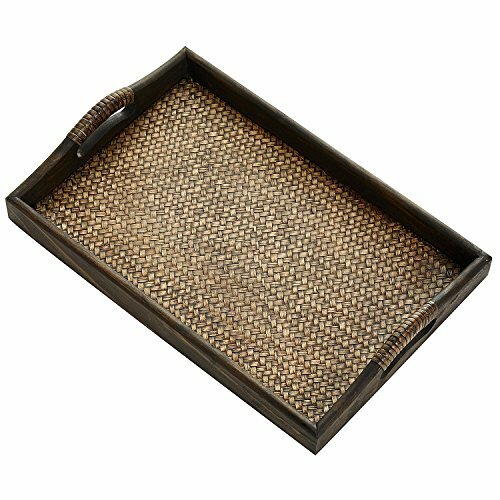 A wooden frame features a woven rattan base, adding a unique element to this gorgeous tray. Two cutout oval handles have be intricately woven with rattan for added stability. Its dark brown stain and durable construct allow you to easily incorporate this luxurious tray into any room. If you have any questions about this product by HMdecor, contact us by completing and submitting the form below. If you are looking for a specif part number, please include it with your message.